Native American Jewelry and especially Navajo Jewelry is timeless and looks wonderful when worn with modern clothes - day or night. The artists from the American Indian tribe of the Navajo are the probably the most prolific American jewelry makers in the Southwestern United States if not the entire USA. Indian Jewelry has been made for centuries, and evenAmerican Indian Jewelry made for tourists has been around for decades. 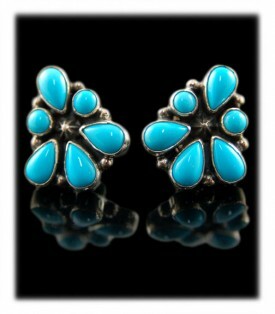 The most popular of all American Indian Jewelry is Navajo Turquoise Jewelry. When you travel the Southwest you will see their famous silver jewelry in most retail stores as well as on large majority of people who live in the region, of every race. Turquoise Jewelry made by American Indians and Anglo artists has become so popular that you will find it being worn world wide! Turquoise is one of the top ten most popular gemstones world wide and has been since the Egyptian times. Most of the Turquoise Jewelry and the Southwestern jewelry from the Southwest has been made by the Navajo or Dine. 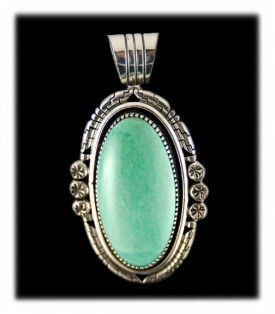 Today , the people of the Southwest wearTurquoise and silver jewellery naturally and gracefully in their everyday life. 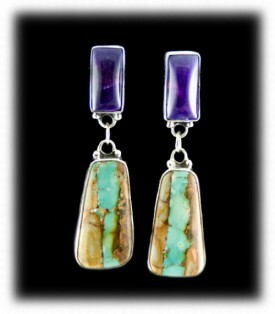 Navajo Turquoise Jewelry today is made with two main utilities in mind. Most of the American Indian Silver Jewelry is made as art and to be sold to collectors and general public to wear and enjoy. The rest of the jewelry is made for Navajo tribe members to wear for ceremonial purposes. 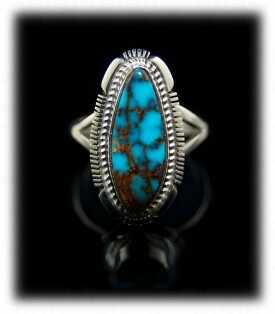 In the past a majority of the Native American Turquoise Jewelry was made for personal use and ceremonial wear. The popularity of American Indian Jewelry really gained ground when the railroads put in the transcontinental railroad and discovered the wonderful handmade beads of the Santo Domingo tribe. Once the major infrastructure of the famous Route 66 went in the popularity and availability of Native American Turquoise Jewelry and Navajo Turquoise jewelry became much greater. In the 1940s through the early 1980s Turquoise Jewelry and American Indian Jewelry experienced a major boom and has retained faithful followers ever since. Much of the silver jewelry and Turquoise jewelry that the Navajo and other Native American Jewelry artists make were and are inspired by classic Spanish designs that were introduced to them During the Spanish Inquisition times. You can read more about this on our page about Native American Jewelry , our Native American Facts page, ourNavajo History page or on our Navajo Jewelry page. Today most Navajo people wearTurquoise and Silver Jewelry, even young children. 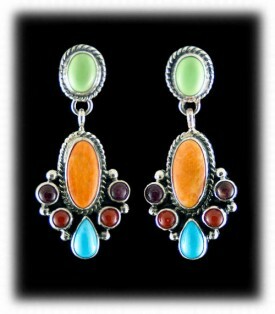 The blend of the traditional and the contemporary is apparent in Navajo Turquoise Jewelry. Navajo Silversmiths always have emphasized bold, simple silver jewelry and have used Turquoise, Coral and other materials as accents for the silver for decades. Tools, techniques, styles and stone preferences have varied through out the decades, though Turquoise has remained the most popular stone used in Navajo Silver Jewelry. The Navajo were the first Native American Indians to learn Silver Smithing. You can learn more about this on our page "General Native Silversmith Information". Silverwork of the Mexican Plateros, as well as the work of neighboring Spanish and Plains Indian peoples greatly influenced Navajo work and would become the basis of the most popular Navajo Silver Jewelry and Navajo Turquoise Jewelry. American and Mexican Silver coins as well as ingots were used to create the earliest American Indian Jewelry. At first the Navajo smiths only had access to crude handmade tools to work the hand forged metal. Today they have access to all the advanced tools and pre-made sheet and wire as other silversmiths use, which helps them make more intricate jewelry, thus the addition of modern Navajo Turquoise Jewelry to their collection of jewelry offerings today. These days you would be hard pressed to find Navajo Turquoise Jewelry which has been hand forged from Ingot or Silver Coins, and this type of jewelry commands high prices. It would be a scary proposition to try to acquire this type of Navajo Jewelry unless you are a jewelry or other trained professional. If you were to try to start collection this type of historical Native Indian Jewelry you would want to study Navajo Jewelry origins, American Indian Jewelry history, and silver smithing techniques intensely before trying to make a purchase. If you study our Learning Center, you will have a better chance of not being ripped off by an un-trustworthy Indian Trader or jewelry dealer. When you do begin to collect rare and high end Native American Jewelry and especially Navajo Turquoise Jewelry it is best to purchase it from a reliable dealer whom has a lot of experience in this industry such as ourselves. Checkout examples below of different varieties of Navajo Turquoise Jewelry we offer. The Navajo began making Turquoise Bracelets around the late 1890's after the first Turquoise stone had been set in silver. Around this time Native American Jewelry was not in it's infant stages, but Silver Jewelry made by Native American Indians was. These early Turquoise Bracelets would have been hand forged from ingot or sandcast and would have been more crude in form. Navajo Turquoise Bracelets have become highly valued by Jewelry collectors worldwide. 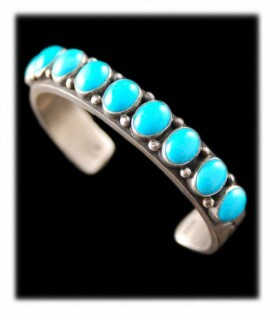 Since the introduction of the Internet the demand for Navajo Turquoise Bracelets has escalated dramatically. Durango Silver Company specializes in high quality Turquoise Jewelry made in America and Navajo Turquoise Bracelets are one of our favorite styles of American Jewelry! Above is a beautiful Navajo Turquoise Bracelet handmade by Navajo Artist Louise Bia. This Native American Turquoise Bracelet features a row of beautiful Sleeping Beauty Turquoise. This classic Turquoise Mine has recently closed and therefor the value of this bracelet will surely climb fast. The bracelet features classic style silverwork with simplicity and beauty. You will notice that each American Turquoise gemstone has bee wrapped in a sterling silver sheet, this is called "bezel set" and is one of the most sturdy types of stone settings. Each stone in this Navajo Turquoise Row Bracelet is separate by classic raindrop designs (little silver balls). 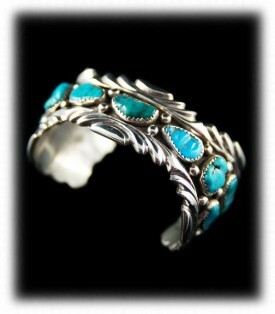 Check out the presentation for this beautiful Navajo Turquoise Bracelet. The Navajo have been very prolific in making Turquoise Jewelry and Navajo Turquoise Earrings are one of the most important types of Turquoise Jewelry items they have made as most every women has loved wearing Turquoise on their ears. Navajo Turquoise Earrings were admired and in demand by their own people in the beginning, as tourism began in the Southwest Navajo Turquoise Earrings were top sellers and still today, Navajo Turquoise Earrings are hot as a fire cracker! Navajo Turquoise Earrings come in Green Turquoise, Blue Turquoise and are identified by their extensive Silverwork the Navajo Silversmiths are most known for. The Navajo Jewelers are prolific and they also make Turquoise Inlay Earrings as well, many Navajo Turquoise Earrings made today are also made with Turquoise accented by other colored stones such as Coral, Spiny Oyster, Sugilite, Lime Turquoise and many other colorful gemstones. Below are several pair of typical Navajo Turquoise Earrings and the different styles of Turquoise Earrings made by Navajo Jewelers. Above are two different styles of Navajo Silver and Turquoise Earrings they are known for making. The Navajo Handcrafted Earrings on the left are called Navajo Cluster Style Earrings as the stones are designed in a cluster arrangement. This particular pair of Navajo made Earrings have Spiny Oyster, Sugilite, Coral and Turquoise Stones bezel set and designed into a very nice pair of Navajo Dangle Earrings. Navajo made Turquoise Jewelry has great character and diverse styles that are timeless, in vogue and considered Fashion Turquoise Jewelry. Navajo Turquoise Rings have become highly valued by Jewelry collectors worldwide and since the introduction of the Internet the demand for Navajo Turquoise Rings has escalated dramatically. Durango Silver Company specializes in high quality Turquoise Jewelry made in America and Navajo Turquoise Rings are our pleasure! 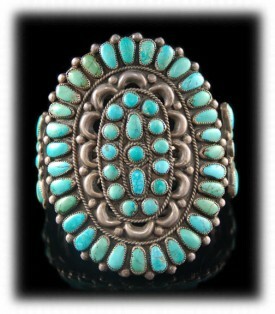 Above is a beautiful Navajo Turquoise Ring handmade by Navajo Artisan Leo Yazzie. This Native American Turquoise Ring features a beautiful Red Mountain Turquoise Gemstone, this Turquoise Mine has been out of production for over 20 years. The Silverwork is of a bezel set stone outlined with twisted Silver wire and then outlined with tooled square Silver wire that has sawed and filed line art. 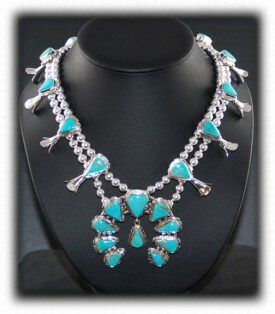 Another form of Navajo Turquoise Jewelry that is very popular is the Navajo Turquoise Necklaces and Pendants. Above are two different types of classic Navajo Turquoise Jewelry Necklaces. To the left is a Navajo Turquoise Jewelry classic, the Squash Blossom Necklace. This particular Squash Blossom Necklace is made of Sterling Silver and features natural Manassa Turquoise from Colorado. To the right is a classic stampwork style Sterling Silver pendant with natural Variscite from Utah. These two pieces are wonderful examples of classic Navajo Turquoise Jewelry. Silver pendants made by Navajo artisans and in the Navajo Jewelry style are probably some of the most popular forms of neckwear world wide. We hope you will take a look at the Navajo Turquoise Jewelry that we presently have to offer and hope you will come back often as we ad new pieces to our collection often. We invite you to take a look at a few of our other presentations - Navajo Silver Jewelry, Navajo Turquoise Earrings, Navajo Turquoise Rings, Turquoise Bracelets Video, Learning Center and our Silver Gallery page. You can visit our IndianVillage.com website for more. 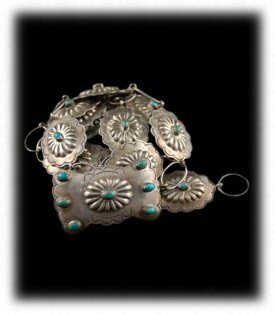 Learn more about Navajo Turquoise Jewelry and American Silver Jewelry by following the links in our Learning Center. In addition, we would like to invite you to join our E-Mail Newsletter - about once every other month we send out a Newsletter to inform our members of what's happening with Durango Silver Company, new products, specials for our members and more. We also have a monthly drawing from our member base to give away free Turquoise Jewelry from our company. Please take a moment to become one of our friends by signing in below. We hope you have enjoyed our presentation on Navajo Turquoise Jewelry and have gained some useful knowledge from it.